Durham is now entering it's 9th year of its summer long Free Yoga in the Park series. Join your fellow Triangle citizens for FREE YOGA every Saturday on the grass in Durham Central Park for 14 weeks starting May 26th-Sept 1st. Packed with a diverse list of teachers and styles, your Saturday morning couldn't get any brighter. Classes kick off bright and early at 9am and go till 10:30. You'll want to bring a mat, water, and sunscreen. Meet on the flat grassy area just above the Prudential Garden, off of Roney Street. Sponsors include: Samadhi Shala Yoga School, Durham Farmers Market, Durham Central Park, The Scrap Exchange, Full Lotus Juice Bar, and Triangle Raw Foodists. For more information about them, please visit our Sponsors page. to incorporate individuality and free expression into her classes. Satya is the owner of Samadh Shala, a donation based yoga school and healing arts center here in Durham, NC. Satya's mission is to help provide the community with classes and workshops that everyone can afford. With 10 years of experience as a Yoga Practitioner, Satya likes to incorporate her knowledge of Thai Yoga Therapy with Thai inspired adjustments and modifications. She will be teaching a mixed level class where all will be tailored to. 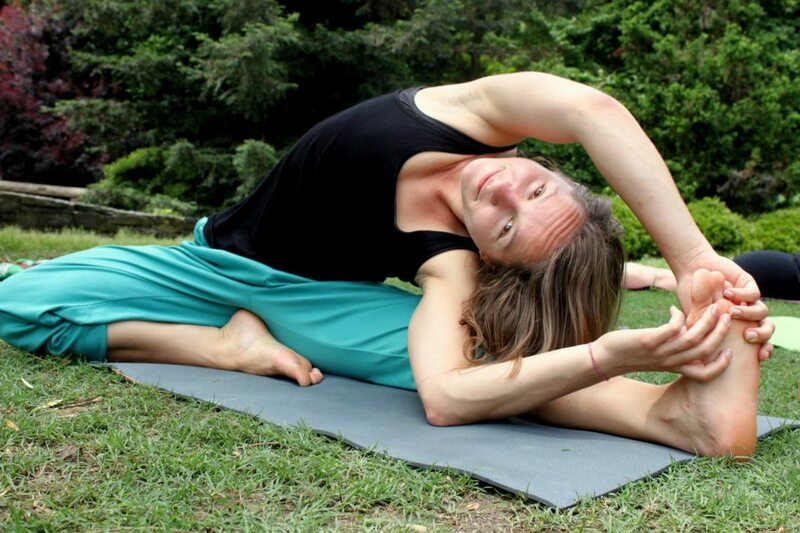 Vera Luck has taught at Blue Point Yoga since earning her teaching certification from Asheville Yoga Center in 2006. In class, she aims to strengthen and release all areas of the body with a mix of vinyasa and grounded relaxation. She loves practicing outdoors and looks forward to her first time participating in Yoga In the Park. As a current teacher at Samadhi Shala, Tanya is known to help her students reach greater depths in their physical practice with awesome adjustments. As a Hatha, Yin, Ashtanga, and children's yoga teacher, Tanya has many styles to offer. Some may be familiar with Danielle as the leader of Triangle Yoga's monthly ecstatic kirtan! As an artist, healing art practitioner, and yoga teacher, Danielle has many gifts to impart on and off the mat. Join her as she focuses her yoga practice on the cultivation of creativity and vitality. Ram is a vibrant and enthusiastic teacher that brings love and joy to every class he teaches. Trained as an Ashtanga Vinyasa teacher, you'll leave feeling more in touch and at ease with your body and mind. Teresa is owner of Mobile Yoga NC bringing on-sit yoga instruction to the workplace and beyond. Her goal is to help people relieve the stresses of everyday life through yoga. Partner Yoga is a wonderful way to explore new aspects of your yoga practice and transform you in a different way. Discover the beauty and benefits of connecting with another person through breath and movement. Melissa and Jon-Erik Lido invite you and your partner to join them for partner yoga practice that is appropriate for all levels of yogis and yoginis. Bring your little one, Ingrid will be teaching a special class where children and parents can experience yoga together! Stay tuned for more details on this one of a kind class. Sharon will be teaching Yoga Dance - a fun combination of yoga warm ups and free style dance set to world and pop music. So much fun you'll forget you're getting a workout! Sherri will be showing you the wonderful practice of Ashtanga with an emphasis on the more subtler internal practice that is often overlooked. This is Irene's second year of teaching for FYITP. We look forward to having her with us again.